"Remember the Alamo!" is a phrase that is woven into the American consciousness, but what do most people really remember about the Alamo? Much of the true story has been shrouded in myth for over 150 years. 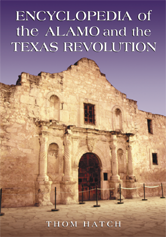 This comprehensive encyclopedia provides thorough coverage for people, places, events and issues spanning the pre-Revolution period and settlement of Texas by Americans to the forming of the Republic in 1836. When appropriate, a mini-chronology supplements the entry, placing the discussion in context. A day-by-day account details the thirteen day famous siege. Entries cover major players such as Santa Anna, Jim Bowie and David Crockett and provide biographies (from obscure sources, in some cases) of every Alamo defender killed in the battle. American and Mexican resources have been used to assure a well-rounded picture of often misunderstood events. Maps and an extensive bibliography complement the text.